Rediscovered this old Malene Birger blazer when I was cleaning out my closet the other day (selling a bunch of awesome pieces here). Loving the contrast of the blue against the warm terracotta color of the bag! JACKET By Malene Birger (old, but similar one here). KNIT Soft Goat. BAG Céline. CULOTTES H&M (similar ones here). SHOES Jimmy Choo. This entry was posted in Outfit and tagged burnt orange, Celine, culottes, tie bag by Carolina Engman. Bookmark the permalink. Gorgeous style. I love the contrast of blue and black. Sharp look! You look absolutely incredible in this outfit and your new bag is pure perfection! This is such a gorgeous outfit! 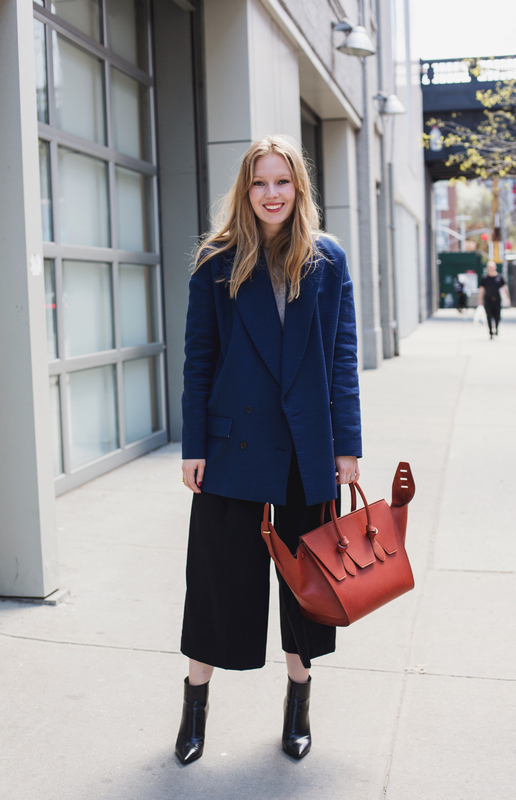 I love the culottes with the boots, and that bag is stunning! Amazing look, love the combination of the culottes and those boots! Amazing outfit! Love how you matched these colors and the culottes are great! Wow, that bag is gorgeous! Oh I definitely love how you styled this outfit! As I already said cobalt color os one of my fav and with the combination of brick red and black colors the blue one goes absolutely perfectly! Love the cobalt blue and orange together! That bag is insane! Absolutely in love with this outfit! The colors match so well together! This look is perfect and I love that handbag. Beautiful. This post is literal perfection. Amazing style, love it. I see your putting that cool bag to use – nice! That bag is too perfect! You are the best! I love all your outfits! And this coat is perfect! Of course, the bag is amazing! 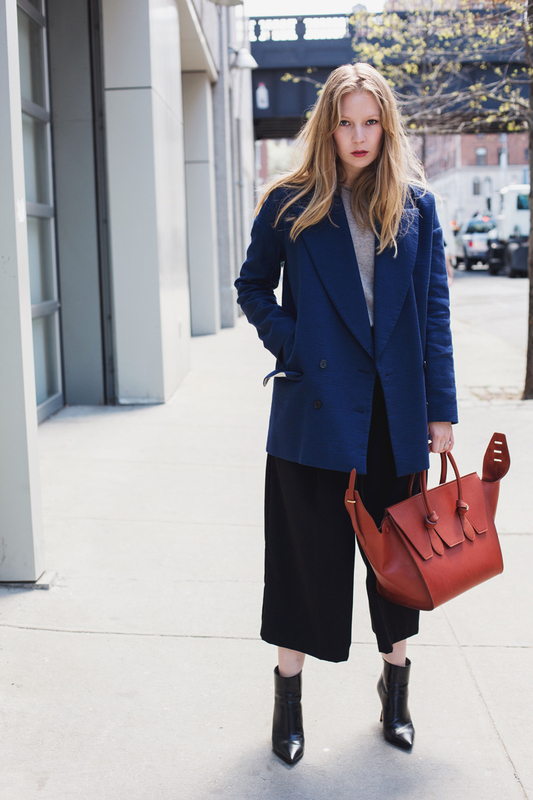 Love that coat with the culottes and the bag is so fab! Great outfit! Culotte and bag are perfect. Super interesting purse! That totally works with the coat! Obsessed with this outfit! Love this classy outfit look with a chic pair of culottes and striking statement bag! Great style! 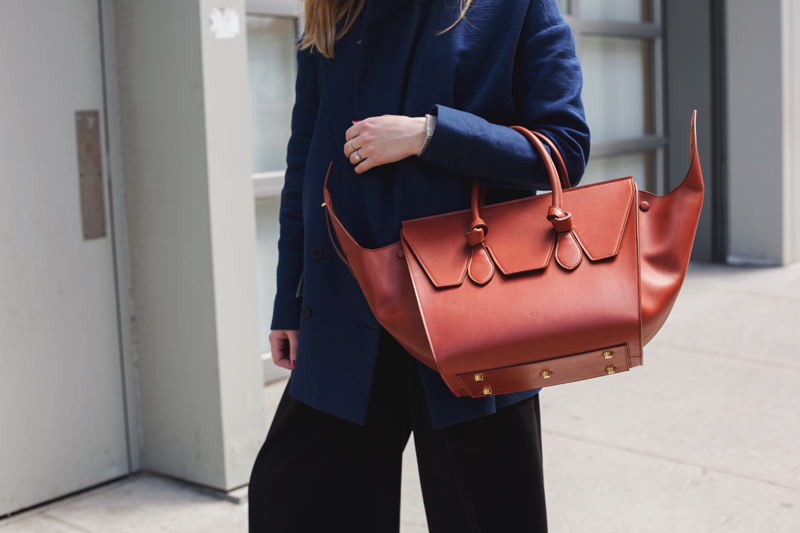 navy and cognac are so classy together! Love the blue and orange combination. Hot boots! That bag and those shoes are just amazing. Love the whole outfit. Love this! Especially the colour combination is so special and cool! 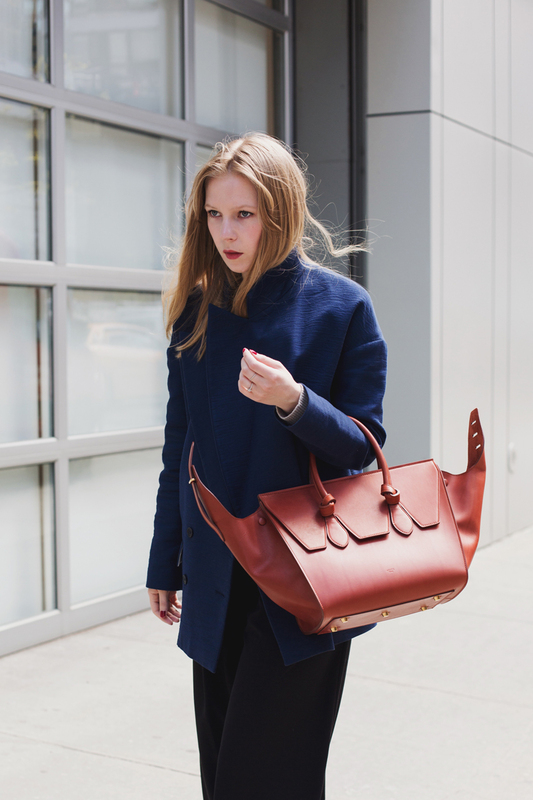 Your coat is sooo gorgeous, especially worn with this incredibly beautiful tan Céline bag !! I really loveeeeee the bag …its unique its different but in a beautiful kinda way. Great color palette and those boots are stunning! The coat is just beautiful!